"Take this palm, Juania australis, - it won't survive with you. It doesn't even grow at Tresco in the Isles of Scilly, but try it anyway. " These were the parting words and friendly challenge from Chris Bailes, Curator of the Royal Horticultural Society's Gardens at Rosemoor, Devon, England as I left following a brief visit to the Gardens in September 1995. The young plant had been raised from seed collected in Chile by Lady Anne Berry, who had donated her 3 hectare renowned garden at Rosemoor to the Royal Horticultural Society. Back in Ireland I tried to find out something about my new acquisition, a small pinnate-leafed 40 cm high plant in a 20 cm pot. Information was non existent in my normal reference books such as the New Royal Horticultural Society Dictionary of Gardening and W.J. Bean's Trees and shrubs hardy in the British Isles . Information was sparse in several books on Palms but I did learn that Juania australis is native of the Juan Fernandez (Robinson Crusoe's island) but is now practically extinct there. 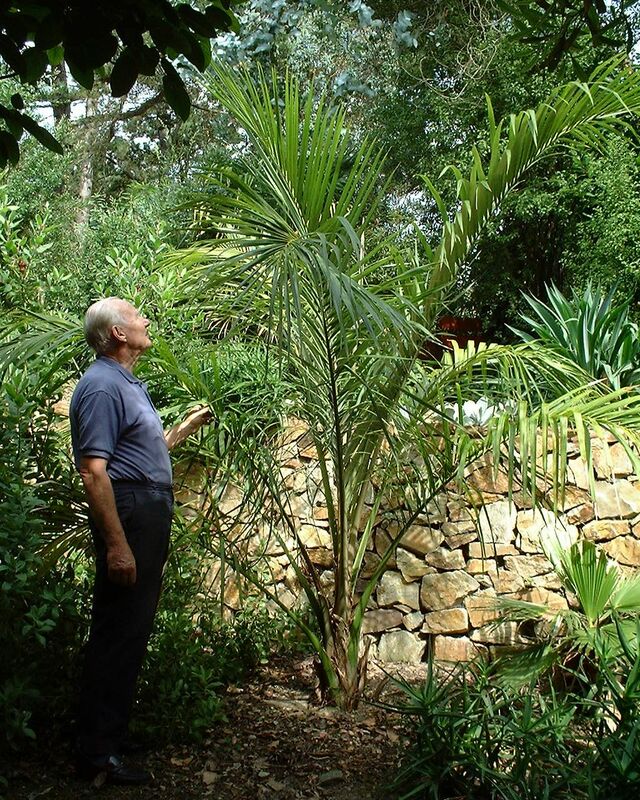 I planted the small palm in a sheltered location about 1 metre from a 1.5 metre high wall. The plant gets some morning and evening sun but is partly protected from mid day sun by a 5 metre high Dodonea viscosa 'Purpurea' to the south and from north winds by a 10 metre high self seeded Eucalyptus cordata. Planted in September 1995, the Juania has grown well and has shown no signs of cold or wind damage throughout this period. It is now about 2.5 metres tall with leaves up to 2.2 metres in length. Although I had been warned that the Juania was rare and difficult to grow, I gave it only the standard treatment afforded to all other trees and shrubs in my garden. The roots at the bottom of the pot were carefully disentangled and spread out in the planting hole, but no fertiliser was applied, either at planting or at any time afterwards. The small plant was kept free from competing weeds, mainly by careful spot treatment with the herbicide glyphosate and the ground was not disturbed to avoid any root injury. No supplementary watering in summer or frost protection in winter was given. I do not use insecticides or fungicides on any ornamental plants as these are generally unnecessary under our cool, temperate climatic conditions. In any case, the Juania showed no signs of pests or diseases and was completely trouble free. As can be seen from my web site www.earlscliffe.com, my garden is situated on a peninsula just north of Dublin, Ireland. The Hill of Howth rises to a height of 180 metres to the north and provides important shelter from cold northerly winds. On the south side the land extends down to high watermark. This fortunate situation along with the influence of the warm North Atlantic drift is responsible for the favourable microclimate. Air frosts occur regularly generally between early December and mid April. The lowest winter minimum is usually about -4º C but, in December 1995, three months after planting, the temperature fell to -7.5º C, the lowest recorded here since records began in 1969. The recent 2000/01 winter was also exceptionally severe when the temperature fell to -7º C in December and for three days the temperature did not rise above - 3º C. These low temperatures had no apparent adverse effect on the young plant. Because of the proximity of the sea, summer temperatures are moderate, seldom exceeding 25º C. The absolute maximum recorded since 1969 was 27.5º C in August 1995. Average annual rainfall is a moderate 650 mm spread fairly evenly throughout the year and periods of drought are rare. The soil is derived from Cambrian shale and quartzite and contains approximately 25% clay and 4.5% organic matter in the top 8 cm. It is mostly acid to neutral (pH 5.0 - 6.5) in contrast to the alkalinity of most of County Dublin. At present Juania australis is growing more vigorously in my garden than any other member of the family Palmae. 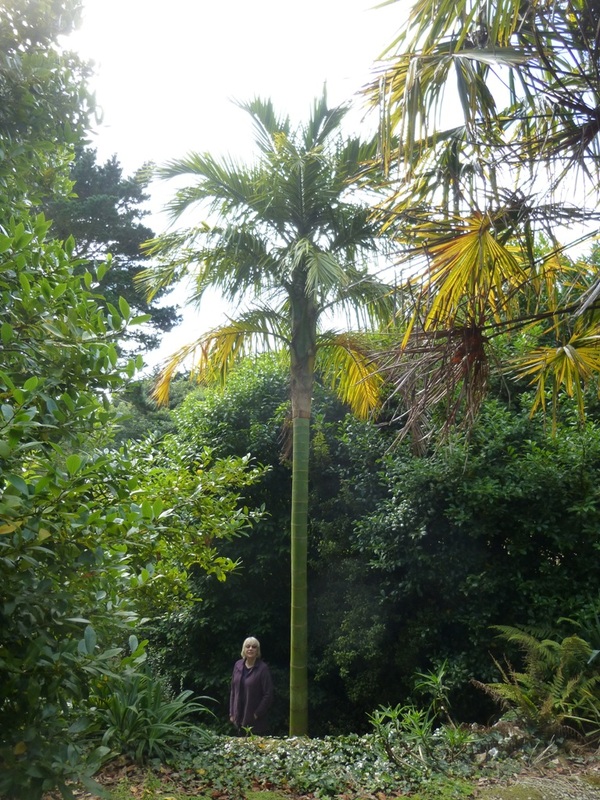 The Chusan Palm (Trachycarpus fortunei) is normally accepted as the most hardy palm growing in Ireland but its speed of growth is less than that of Juania. I also grow the Mediterranean Fan Palm (Chamaerops humulis) and the Chilean Wine Palm (Jubaea chilensis) but these and other genera, such as Brahea and Butia are slow growing. The plant was undamaged by the severe winters of 2010 and 2011 and is still, by far, the fastest growing palm in the garden. The picture of the plant in the article above was taken in 2003. The picture below shows the plant in Sept 2016. In June 2017 it produced its first inflorescence. It can now be identified as a female of the species. By August 2017 it had probably put on an extra metre in height in a year, with no sign of slowing down!